Posted Aug 20, 2018 by Eds. By Roger D. Harris: Before the violence that started mid-April, Nicaragua had been the most peaceful, safest, and by far the most progressive country in Central America. Now that a semblance of peace has been restored in Nicaragua, the U.S. government continues its campaign for regime change joined by some who formerly supported Nicaraguan President Daniel Ortega and his Sandinista party. While much has been written for and against Ortega, what might replace him were he to leave is less well fleshed out. Latin Americanist academics Dan La Botz and Benjamin Waddell, both with extensive experience in and knowledge of Nicaragua, give us some insights into what might be expected were the opposition to take over. Although La Botz and Waddell are firmly in the “Ortega must go” camp, they are not naïve about U.S. government interference in the internal affairs of Nicaragua. They are not among those that claim, incorrectly, that the uprising was simply a spontaneous phenomenon. It’s becoming more and more clear that the U.S. support has helped play a role in nurturing the current uprisings. U.S. organizations such as USAID and the National Endowment for Democracy (NED), and no doubt the CIA had for decades, of course, worked in Nicaragua as they do everywhere in the world. La Botz concludes his article with the demand “the U.S. must keep out.” But his evidence suggests that he should be demanding that the “U.S. get out” of Nicaragua. Since 2014, the National Endowment for Democracy (NED), which was established in 1983 to promote democratic ideals in developing countries, has spent $4.1 million on projects in Nicaragua. In 1990, against all odds, Chamorro defeated Daniel Ortega, and ushered in three consecutive terms of conservative leadership. Regardless of whether Mr. Ortega is removed from power, the NED’s involvement in Nicaragua reveals the potential for transnational funding to contribute to the cultivation of the type of skill sets, networking, and strategies necessary for civil society to successfully challenge authoritative (sic) governments. Developments to date give little credence to the hope for a student opposition that is leftist. For instance, a delegation of opposition students went to Washington financed by the rightwing Freedom House to lobby for U.S. sanctions against their own people. According to NACLA, these students “shared pictures on social media posing with Senator Marco Rubio (R-FL) and Representative Ileana Ros-Lehtinen (R-FL), who represent most conservative, right-wing and hawkish sectors of the Republican Party.” More recently the Nicaraguan opposition student voice was heard on a regime change panel at the Koch brothers-funded, rightwing Hudson Institute. These are not leftists. The MPRS or Rescate, an on-and-off left split from the MRS, is a minor actor. It is composed mainly of Mónica Baltodano and Henry Ruiz, who are active on the web and doing interviews. The more prominent MRS broke from the main Sandinista party in the 1990s. The MRS, heavily composed of intellectuals, never developed a popular base among the Nicaraguan people. Starting off as a left opposition to the Ortega wing of the Sandinistas, the MRS has since shifted to the right. MRS leaders are partly supported by their connections to the U.S.-funded NGO world and are in alliance “with parties with a neo-liberal agenda.” MRS national president Ana Margarita Vijil and Managua president Suyén Barahona hobnob with rightwing U.S. politicians. Calling the MRS left is like the Tea Party’s claim that Obama is a socialist; it’s a matter of perspective. There is, however, the possibility that the democratic struggle could open up a social struggle that would create a new left. In sum, the picture presented by La Botz is that presently the opposition to Ortega is not democratic or left, but that he hopes it could be, despite troubling ties to U.S. intelligence agencies and NGOs. In fact, many in the (opposition) movement and the civic alliance are fervent anti-Sandinistas. These are people who do not just oppose Ortega and Murillo in the current context but also pro-capitalists who have attacked the Sandinistas since their emergence. This group includes Somocistas (those who defend the legacy of the Somoza dictatorship), Liberals, Conservatives, and former Contras. 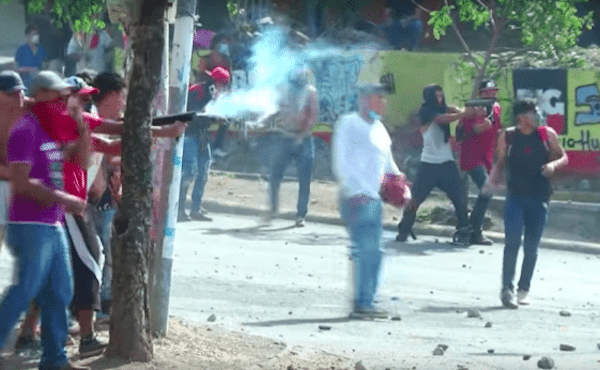 There is growing evidence that from the ranks of anti-Sandinistas such groups are arming themselves and gaining momentum. La Botz criticizes what he calls the “neo-Stalinist left” who oppose U.S. intervention in Nicaragua. These same people that La Botz criticizes were also opposed to U.S. intervention in Libya, which left that formerly thriving country a disastrously failed state where slavery is now practiced. There is a lesson to be learned about consistent anti-imperialism, and it is not supporting U.S.-backed regime change. Nicaragua has been tragically destabilized, threatening to reverse the major social gains achieved by the Ortega government. The North American left should unite around “U.S. out of Nicaragua.” Let the Nicaraguan people choose their own government through elections as they have in 2006, 2011, and 2016 when they returned Ortega to the presidency with ever increasing voting margins. Beyond the U.S.-backed interests and their NGO-activists are undoubtedly genuine social elements in opposition to Ortega. Likewise any political party, especially one that has been in power as long as the Sandinistas, could benefit from rectification. But these are agenda items to be addressed by the Nicaraguan people without outside interference. The ossification of polarized positions in a climate of opposition-provoked violence guarantees nothing gets rectified and everyone loses. The U.S. is the world’s hegemon, imposing global neoliberalism. The Ortega government in Nicaragua has been targeted by the hegemon precisely because it has not served as an unquestioning client state. The fall of the Ortega government would close one more space for any alternative to the empire to survive. Roger D. Harris is on the board of the Task Force on the Americas, a 32-year-old anti-imperialist human rights organization.